Playing outdoors encourages children to exercise and is the perfect opportunity for the family to get a breath of fresh air. Outdoor games range from freeze tag for younger children to croquet for adults or teams of younger and older players. Consider who's playing and find a game that excites everyone instead of staying indoors watching movies. These game ideas get you started, and the various games are fit all ages in your household. Activities that get your heart pumping are a good way to stay in shape. It's especially important for children to get enough exercise during the day, and these games are perfect for both kids and adults. Start with a game of freeze tag to get warmed up. Played like regular tag, one person is "it" and must tag another person. When the person who is "it" tags someone, that person must freeze in place until another person untags them. Take turns being "it" so each child gets a turn. Dodgeball and volleyball both require physical exertion while helping hand-eye coordination. Use softer balls for children and if there is no volleyball net, draw a line in the dirt to act as the make-shift net. This line can also divide a yard for playing dodgeball. Those who have sports equipment and random outdoor toys can play some different variations on their favorite games. For example, baseball may seem boring, but children enjoy playing Rolly Bats. For this game, one person is the batter and the other throws the ball. After the batter hits the ball, the person who threw it must ran to catch it. Then, as long as the batter is holding the bat the person who caught the ball can run towards them. When the batter drops the bat, the person holding the ball must stop before it hits the ground. The batter then picks the bat up if they want to let the person get closer or decides to leave it where it is. The person holding the ball rolls it towards the bat and if it hits the bat, they get to bat next. If not, they throw the ball and the batter hits it again, repeating the process as before. Children can also set up an obstacle course and race to see who is fastest. Use a stopwatch to time each child and use various activities, such as throwing a basketball into a trash can, hula-hooping for 30 seconds or jumping rope five times. Change the activities each time for a new and exciting obstacle course. Certain games can be purchased from the store with all the required equipment. Croquet and badminton are challenging games for both older children and adults. Two people can play badminton at a time and two games can be played simultaneously with the winners facing off against each other. Players hit an object back and forth without letting it touch the ground using their rackets. 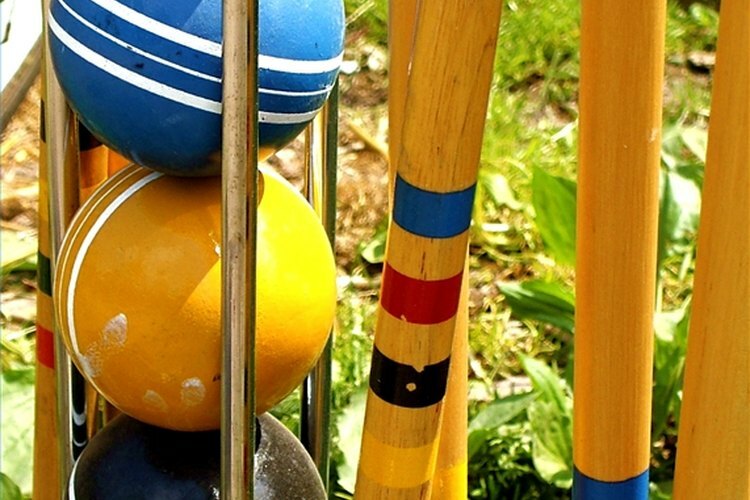 Croquet allows four to eight players to play one game, depending on the size of the set. Players may also form teams to compete against each other. Players use mallets to knock balls through hoops on the ground and try to make it through the entire course first.